My creative goal for 2016: 100 faces! Is anyone setting any creative resolutions for 2016? After a year of making art daily, I’ve learned that of all the subjects I’ve tried, I enjoy faces most. So I’m setting a goal to do 100 faces in ’16. For me, anything with eyes and a mouth counts as a face (yay, birdies included). I’ve been sketching up a storm this past month, and really loving it. On Christmas Eve, I sketched a friend’s dog with a Polychromos colored pencil from a photograph. Sheldon was a challenging subject (and darned cute, to boot)! He was also lots of fun, and his owner was really happy with the drawing, which was very cool. So far, I’m finding dogs easier to draw than cats, and not sure why, as I’ve had a cat pretty much all my life, and haven’t had a dog since I was ten (still miss sweet Tippy, though). Anyway……here’s my first dog drawing from a year ago, and I do feel I’ve improved some since then, so…..we’ll see where this goes. I’ll be trying faces in pen, graphite, pastel pencils, colored pencil, watercolor pencil, watercolor crayons and other water soluble media…..but I’d like to eventually work up to painting animals in watercolor. I’m also planning to experiment with toned paper to spice things up a bit. We’ll see what the year brings! Would love to hear about your creative goals for 2016! Wow, sounds exciting! Good luck with it! Thanks, Denis! I really appreciate that. I think Charlie’s face may be a bit too challenging for me at this point (black is especially tough), but it would be a really nice one to work up to! Glad you enjoyed this one! Thanks so much, Tom! They’ll most likely be only sketches, most of them, but as you know, trying to capture a likeness of an animal or person is challenging. I’m really looking forward to hopefully some improvement in my work this year. Thanks for your encouragement and support. Your feedback is most appreciated. Happy New Year to you and best to you in 2016. Do you have a creative goal for the new year? My goals in 2016 are to paint and draw more so as to advance my skills, and to move to the next level by adding more personal expression in my work. Progress not perfection. Sounds like terrific goals, Tom! Personal expression is something I’ve been thinking a lot about also. LAURA!!!!!!!! YAY! I was SOOOO excited to see a Create art everyday Post today! YIPPEE!!! I’ve so missed your posts. And what a great post to boot! Full of inspiration and a goal and AN AMAZING sketch of sweet Sheldon! Your skills have definitely grown! Wowza! I did a little painting last night. Felt so good. Need to get back at it now that the holidays are over. January is a great month to take time to paint! YIPEE! Still on Christmas holiday – so enjoying the time to do what I please. 🙂 Welcome back. Looking forward to your 100 faces! No problem sweet friend! I surely understand how that can be!! OOOHHH I cannot wait for face guessing games and beautiful animals!!! I am giddy with excitement! 🙂 Going to do some play painting today! Sounds like wonderful goals, Kathy! I’m sure your photos will help me get to my goal of 100 faces this year as well! 😀 Happy New Year to you and yours! I feel particularly close to this post….after doing a month of faces….Facetober(october) and then a month of dogs…..your dog portrait is perfect! I think it is a wonderful resolution, and when you look over your 100 you will amaze yourself! I look forward to it all! Thanks so much, Rebecca, and for all of your encouragement. Your work is amazing and I think black dogs are absolutely the most difficult. You only make them look easy! Happy New Year, my friend! Happy Happy and Creative New Year to you, my friend! And great image–as always, your eyes tell so much of the story. Great work! You’ll make it. You have the power! Thanks. I have the fire in my belly now. We’ll see if it keeps burning. If I see improvement, I think that’ll really help fan the flame. Lovely sketch – and what a great goal! Thanks so much, Iris! I hope I can do it. It’ll be interesting to see what 2016 brings. Glad you enjoyed this sketch. Fur and hair are fun to do. That is a wonderful goal and good luck. A few years ago I decided to sketch 50 human faces but only accomplished 30 but I am so much more comfortable now sketching people so it does work. Wonderful to hear this, Teri! I was wondering how many faces I would actually do. I’m definitely on fire for it now, but sometimes those creative fires can morph into other things. I think capturing a likeness in animal or human is a challenge, but I love a challenge. And at this point, I think I’m better at drawing than painting, so I have to go to my strengths. We’ll see where it leads. Thanks for the encouragement! Happy New Year to you! I have some other things in that post, and the painting is one of 4 main subjects of the post, so the painting isn’t the only thing in the post. However, if you wouldn’t mind reblogging it like you said, that would be amazing! Thanks so much, and I’ll be happy to return the favor anytime! Oh also, would you mind letting me know when you reblog it? Thanks! Hi Evan, I’ve been slammed with year-end work, but I hope to get to this soon. Glad you got 100 on it, that’s terrific! Awesome, thanks Laura! Don’t feel like you have to rush! Just do it whenever is convenient for you 🙂 Hope your work isn’t stressing you out too much with this holiday season we’re in! This dog AND your first looks really good to me! Great job! Thanks so much, CAS! I really appreciate your feedback! Happy New Year to you! 100 faces, Laura, that’s quite a challenge! However I’m sure you’re up to it. Looking forward to seeing what you do. My 2016 goal will remain producing one postable picture a week – I still find that a challenge! 100 faces, you will meet that challenge and learn so much on the way. Both dogs are good although it will be interesting to see where you are 100 faces from now. Remember the eyes, the window on each face. No resolutions. I do six week evaluations, look back through my sketches for the last 6 weeks and then decide on a focus on for the next six weeks. Sometimes it works! I look forward to seeing your 100 faces. Thanks, Laura. Hopefully, they’ll be worth looking at. hehe. We’ll see. Best to you in the New Year! Cute little dog. Can’t wait to see the 100 drawings. Thanks so much, Julie, and same to you! I did draw a horse head the other day that turned out much better than I thought, so maybe I can try out your horse images at some point? Do you have any in particular you’d like me to try? Beautiful horse, Julie. A challenging subject (as all horses are), but would be fun if I could capture him on the page. Indeed, you have improved a great deal. Great stuff! Thanks so much, Maggie! We’ll see where the year takes us. I always appreciate your feedback & support. Happy New Year to you and the fiddler! Nice job on this little pooch! Glad to see you’ll be arting and posting next year…. happy new year! Thanks and same to you, Rachel! I really appreciate your encouragement and feedback. You’ve been there almost from the beginning and your wisdom has helped me a lot! I wish all the best to you this coming year! 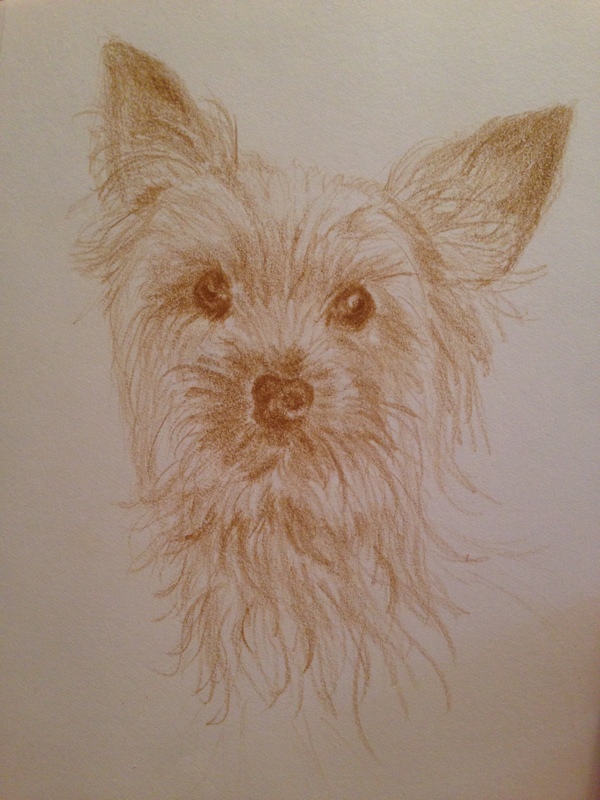 hi Laura, wonderfully expressive drawing of the yorkie, with lovely lines! Great to see you post! I look forward to seeing how ever many faces you get to do 🙂 YAY Laura!! Very true! And I LOVE eyes so I was thinking actually of doing some closeup animal eyes. I was doing partial faces with an eye closeup last year early on and they looked really cool and got great feedback. Would be fun to revisit! Thanks as always for your support, Debi! fabulous!! and you’re a very special and nice person Laura, so its my pleasure! Laura like your animal art too! Good luck with your 2016 creative goals! I have not set any for myself yet. Will wait it out and see if anything comes to mind. Happy New Year! Thanks, Jennifer! I hope to exceed it, but we never know how these things will play out. Gotta go with the gut always, I’ve found, and see where it leads. I really appreciate your encouragement. Have a wonderful 2016! Agree! Best wishes for a creative and happy New Year! Wonderful portrait and such a great goal you have. Looking forward to seeing your progression and being inspired by your creative adventures. Peace. Thanks so much, Haunani! I hope I can inspire you! Your work always inspires me. I hope you have a terrific New Year! Thank you Laura, and yes, you always inspire and encourage me. Wishing you a great and creative New Year! Peace. A darling pooch, such a sweet face. Have fun with your 100 faces. An exciting challenge Laura. Thanks so much, Sharon! I’m hoping this challenge takes me somewhere really good. I really want to do art, for real. I love it so much; I feel like any passion this strong has to become something more as long as more effort is devoted to it. I’d really like to exceed my goal. Will be interesting to see where this leads. I always appreciate your feedback and encouragement and I hope 2016 is really good to you! I’m so happy for you Laura, like anything worth doing it’s all in the practice. And, that’s exactly what you will be doing! Art has been my number one passion my whole life. I create everyday! It will be fun to share our creations this year. I don’t have a particular goal….just draw and paint! Absolutely! Last-minute ideas are best hehe! I’m glad you liked my sketch, Charlie. I hope I can do it. I’d like to exceed it, but you know how it goes…..it’s easy to get all on fire about one thing and then when the rubber hits the road, may be a whole different thing. I do enjoy animals though and faces too but neither is what I would call easy. I’m just trying to get better and I figure this is the only way to do it! Good luck coming up with your January / 2016 plans, and thanks for visiting & encouraging me, as always! Does it really help you to have a monthly focus? Oh my gosh that is a wonderful puppy drawing!! I haven’t chosen any blogging goal for 2016….I guess I better decide soon! Wish I could…but I do better with a goal! Laura, the artist’s world is limitless in his or her vision which creates the canvas for our imagination. I look forward to your creations. Great sketch of the dog. Thank you so much! I’m glad you enjoyed it! I’m very curious to see where this goes. Oh yay, I’m glad your drawing enthusiasm is still going strong! Amazing dog portrait! Such a cutie. I love his cocked head and his hair is beautiful :-). Laura, love your resolution to do 100 faces! looking forward to seeing them. Here’s to a creative year! Thanks Eileen! I hope 2016 is good to us both! Glad to see you coming back. Cute dog, and great goal. Thanks, Kerfe. Maybe my goal should be to do even one self portrait! I really admire you for doing those. I’m enjoying seeing the wide variety of work you and Nina produce. I’m going to try and keep my goal interesting by changing up mediums and papers occasionally, but really what I’m trying to become is a more “serious” artist. I’m trying to really hone my skills in the hope of becoming marketable. Is it a pipe dream? I don’t know. But I feel like there’s a reason I’ve been pretty much obsessed with art for the last year and a half, and I’m hoping it’ll lead to a whole new chapter in my life. There has to be a reason, right? Oh Art Guru, tell me true! lol Happy New Year to you both!! What a great goal! May it come true in 2016. Happy New Year! Is that your dog’s name too? Thank you, Ann! Thank you so much! I’m enjoying it very much! So glad you stopped by! Thanks for stopping my little hole in cyberspace and liking the page, plus now following … I will take some time and look through your blog – I love the drawing you’ve done of the little doggy, brilliant. Thanks for visiting and commenting, I appreciate it. I do mostly realistic work at this point, but went through an abstract phase last summer and thinking of dipping my toe back in. Glad you stopped by!